SGK Gun Show Meadow Event Park April 6-7, 2019 Show hours: Sat 9-5 Sun 10-4 Ticket allows entry for both days with hand stamp. Children 14 and under are free. SGK Gun Show Hampton, Va March 16-17, 2019 Show hours: Sat 9-5 Sun 10-4 Ticket allows entry for both days with hand stamp. Childeren 14 and under admitted free with adult 21 years or older. No loaded firearms or loose amunition are permitted in building. 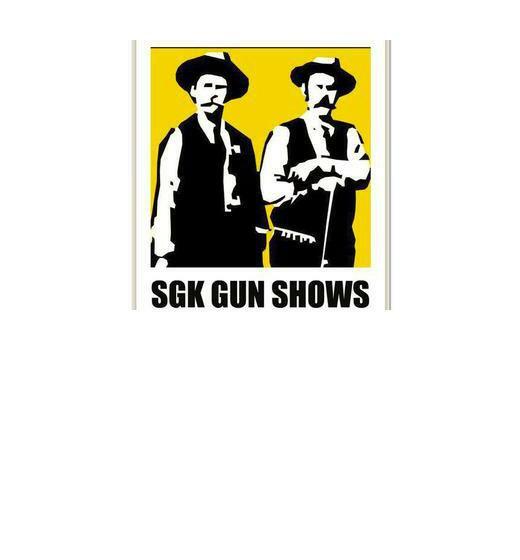 SGK Gun Show Fredericksburg, VA March 9-10, 2019 Show hours: Sat 9-5 Sun 10-4 Ticket allows entry for both days with hand stamp. Children 14 and under are free. No one under 18 years of age is admitted without legal guardian. No loaded firearms or loose amunition are permitted in building. SGK Gun Show Meadow Event Park February 23-24, 2019 Show hours: Sat 9-5 Sun 10-4 Ticket allows entry for both days with hand stamp. Children 14 and under are free. SGK Gun Show Fredericksburg, VA January 26-27,2019 Show hours: Sat 9-5 Sun 10-4 Ticket allows entry for both days with hand stamp. Children 14 and under are free. No one under 18 years of age is admitted without legal guardian. No loaded firearms or loose amunition are permitted in building. SGK Gun Show Hampton, Va January 12-13, 2019 Show hours: Sat 9-5 Sun 10-4 Ticket allows entry for both days with hand stamp. Childeren 14 and under admitted free with adult 21 years or older. No loaded firearms or loose amunition are permitted in building. SGK Gun Show Meadow Event Park December 15-16, 2018 Show hours: Sat 9-5 Sun 10-4 Ticket allows entry for both days with hand stamp. Children 14 and under are free. SGK Gun Show Fredericksburg, VA December 8-9, 2018 Show hours: Sat 9-5 Sun 10-4 Ticket allows entry for both days with hand stamp. Children 14 and under are free. No one under 18 years of age is admitted without legal guardian. No loaded firearms or loose amunition are permitted in building. SGK Gun Show Hampton, Va November 24-25, 2018 Show hours: Sat 9-5 Sun 10-4 Ticket allows entry for both days with hand stamp. Childeren 14 and under admitted free with adult 21 years or older. No loaded firearms or loose amunition are permitted in building. SGK Gun Show Winchester, VA November 3-4, 2018 Show hours: Sat 9-5 Sun 10-4 Ticket allows entry for both days with hand stamp. Children 14 and under are free.